SS. 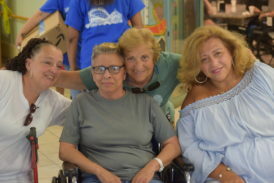 Joachim and Anne Nursing and Rehabilitation Center in Coney Island celebrated its feast day surrounded by friends and family. SS. Joachim and Anne are not only the parents of the Blessed Mother, but are also the patron saints of grandparents. Many of the SS. Joachim and Anne residents are parents and grandparents themselves and were able to enjoy the day with their loved ones with Mass, a summer barbecue, live music, games and raffles, including a new flat-screen television. Sundowning syndrome refers to a state of confusion, anxiety and aggression among those with dementia that commonly occurs in the late afternoon and into the night, according to the Mayo Clinic. Lisa Denis, residence administrator, knows the upgrades will be able to make a huge difference. 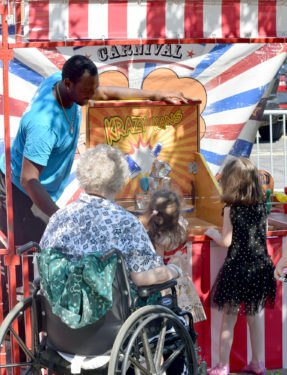 “I am so happy that so many families were able to come and enjoy a beautiful day with their loved ones. This is all for the patients. They deserve this. This is the 27th year of the facility and every year we are trying to get better. Mass was celebrated in the chapel by Msgr. Alfred LoPinto, diocesan vicar for human services, and CEO for Catholic Charities Brooklyn and Queens. “We have both long term and short-term patients here and they all get the care that they need. We have Mass here every day for all that would like to join,” said Msgr. LoPinto. Linda Desgro, who is undergoing rehabilitation at SS. Joachim and Anne Nursing and Rehabilitation Center, was happy to share the feast-day carnival with her sisters. Linda Desgro, who arrived at SS. Joachim and Anne Nursing and Rehabilitation Center for rehabilitation a few days before the feast, was able to enjoy the day with her sisters.